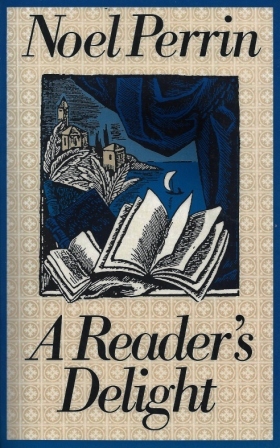 A Reader’s Delight by Noel Perrin ~ 1988. This edition: University Press of New England, 1988. Softcover. ISBN: 0-87451-432-0. 208 pages. I hold the late Noel Perrin (1927-2004) in very high regard ever since reading several of his thoughtful essay collections (First Person Rural, Second Person Rural) some years ago. Perrin enthusiastically promotes forty books (actually thirty-eight books and two poems), which he thought deserved greater circulation. His essays are passionate, most often humorous, and exceptionally convincing. A true joy to read all on their own, with promise of future reading pleasure if one can track these titles down. Some will definitely entail a “quest”, while others are still in general circulation and relatively easily found. I greatly enjoyed and highly recommend this essay collection. I had already read and appreciated a few of the titles on the list but most were unknown to me. I will be seeking many of these out, or at least keeping them in mind while used-book searching in the future. Happy hunting, and happy reading!